It looks like you’ve got the acting bug. Well, let me tell you now, that’s never going to leave you. Ever. You see, some of us are wired that way. We don’t want to act – we need to. Not because we crave the limelight, or the lifestyle of the rich and famous. But because we’re fascinated by drama, by stories and the human condition…and we know we have something important to add. That’s what the acting bug is. Unfortunately, life (and bills!) can easily get in the way. I talk to many aspiring actors who tell me they’re treading water…too busy making a living to carve out the life they deserve. Add to that, well-meaning friends and family chipping in with negatives…(“actors are poor, work is scarce”)…and the leap from aspiring actor to pro can feel very scary indeed. And that saddens me, because I see talented people missing their true calling. Missing out on a rich, fulfilling life and the chance to make an excellent living. I’ve put together a new resource – an online video series, to give you a foundation in acting without breaking the bank. Best of all, you can study it in your own time and set your own pace. So there’s no need to pack in the day job yet, or juggle family life. Hold on, though. Who am I to share this with you anyway? I’m glad you asked! My name’s Brian Timoney, and all modesty aside, I’m one of the world’s leading coaches in the art of Method Acting. I run my own acting studios in London and Los Angeles, with the help of my hand-picked team of specialist coaches – the best in the industry. Together, we’ve helped thousands of students escape the 9 to 5 and realise their dreams of living the actor’s life. It’s thrilling to see the people I’ve worked with doing the job for real – whether it’s on the West End stage, on the big screen or on TV. And naturally, I’m no stranger to treading the boards myself. After 20 years in the industry, I’ve worked with some of the world’s best actors, plus legendary film directors like Ken Loach and Danny Boyle. But (here’s the important part) I wasn’t born an actor. Like you, I did my stint in the rat race. And I hated every minute. It drove me to distraction, watching the clock tick slowly day after day. Looking back, I wouldn’t wish it on anyone. I certainly don’t wish it on you…! 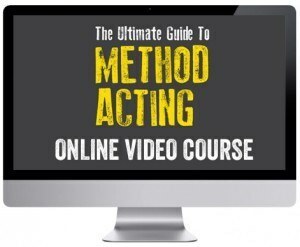 I developed this because people who read my book The Ultimate Guide To Method Acting kept asking me for practical exercises and demonstrations. Plus, students from my classes and boot camps wanted an easy reference point for all the key information. Dive straight into the first lesson, and discover the difference between ‘playing’ a character and ‘becoming’ the character. So many actors stumble over this basic hurdle…so I’ll start by giving you a clear direction. An instant advantage. Using your own life as an anchor…because you can’t feel another person’s emotions! Why you can’t play the finished character on day one – a lesson from Rembrandt! The director’s expectations – things you have to do consistently if you want a long career in film! Let’s be clear: I’m not promising that you’ll be the next Meryl Streep or Al Pacino! All I can do is give you the tools – then the hard work is down to you. But I am promising you all the fundamental skills and techniques of Method Acting – as used by 80% of Best Actor Winners at The Oscars since 2000. You won’t find this level of detail in any other acting course, unless you train with me in person. No-one else – even UK drama schools – will teach you The Method in this depth, or with the same easy step-by-step approach. You’ve read this far, so there’s no question – you’ve got the acting bug! Please don’t look back at this moment years from now, filled with regret. Do you try the exercises and decide it’s not for you? Or take your new found skills, and commit to a new career finally doing what you love? You’ve got nothing to lose. And the gains are unimaginable. P.S. Remember, The Method will give you the edge over most other actors. You’ll be developing skills used by the elite – the world’s top 1%. Yes, it takes work. I don’t pretend otherwise. But if you’re cut out for acting, it’s work you’ll enjoy.